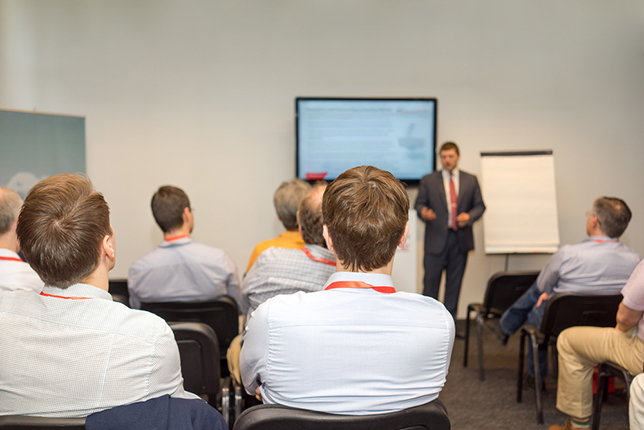 From certifications and industry conferences to manufacturer training classes, here are three ways to keep up-to-date with the latest audiovisual design, installation and support. Working in a technical role, especially within a rapidly changing industry like audiovisual design, installation and support, means that you constantly have to keep your finger on the pulse of ever-changing technology and design trends. I've worked with a wide variety of higher ed AV support staff, with some keeping up with technology and others letting it pass them by. I've made the decision to be diligent about keeping up with technology and industry trends, but it's not always easy to figure out the best methods of doing so. Everyone in AV design, installation and support roles seems to be busy and often totally overworked. Throw in the fact that departmental budgets are always being tightened, and you have a recipe for needing to really pick and choose the most effective professional development opportunities out there. I've spent lots of time in my professional life acquiring certifications, taking manufacturer training classes and attending conferences. This article conveys my opinions and experiences with all of the above. There are plenty more professional development opportunities than I touch on here, but hopefully these suggestions point you and your staff in the right direction. Other than being a member, I have no affiliation with InfoComm International, but anyone who knows me understands that I'm a big fan of the various CTS (Certified Technology Specialist) certifications. There are three types of CTS certifications: the basic CTS, which focuses on industry trends and core AV technologies; the CTS-D, which focuses on AV design and project management; and the CTS-I, which focuses on AV installation practices. I've taken the time over the years to acquire all three of these InfoComm certifications, and I'm very pleased that I made the decision to invest my time in doing so. I feel that all staff members in higher ed AV design, installation and support departments should be required by their management to obtain the basic InfoComm CTS certification within one year of being hired. It not only establishes that employees are at a certain knowledge level with a baseline understanding of the AV industry and the core technologies, but the study process is also very worthwhile. There's no way that any one staff member can be an expert in every facet of the AV industry, but the process of studying for the CTS exam is a great way to at least introduce AV support staff to all the different areas of the AV industry. Your live event support technicians will begin to understand what the integrated systems designers are doing, and vice versa. Once AV staff members have obtained the basic CTS certification, they can move on to the next level: the CTS-D (design) and CTS-I (installation) certifications. These are really made for individuals in roles that focus on specific system design and installation duties, and not for your AV support generalists. I believe that it's important for every higher ed AV support department to have at least one CTS-D on staff. Even if you don't have a staff member 100 percent devoted to AV system design, you must have someone who at least initiates AV installation projects by writing a program report or scope of work, and works with your independent consultants/integrators. That person really needs to have a CTS-D, to make sure that he or she has a baseline of AV system design and project management knowledge. I found the study process for the CTS-D exam to be one of the most worthwhile aspects of obtaining my various CTS certifications. The CTS-D exam is certainly the most challenging exam of the three, and I've seen some experienced system designers fail it. The study process really brings together all the InfoComm and industry design standards that the test is based on. Passing the CTS-D exam was my most rewarding professional development achievement. The CTS-I (installation) certification is another all-encompassing exam that requires a study process, but it isn't a certification that I see very often among higher ed AV support department staff. Often, these departments are relying on AV support staff to provide level one and two troubleshooting and minor equipment repair/replacement, but they push major equipment repair and systems installation out to integration firms. For that reason, I feel the CTS-I certification is a bit too advanced for the level one AV support folks, and most departments don't have a higher level installation technician on staff. When I took the three CTS exams, the study process was a bit more challenging than it is now. Currently, InfoComm publishes study guides for the three exams. These books didn't exist when I took the exams. The study guides cover the majority of subjects in the exams, but it's still important for the student to pull knowledge from industry experience as well as outside study sources. I've taken many of the online and classroom courses offered by InfoComm. I found many of the online courses to be a bit outdated, and I really got much more from the organization's in-person classroom courses. I took a great online CTS-D study class with InfoComm instructor Tom Kehr that really helped bring many of the design concepts together, but I still did plenty of research using alternate sources. One of the big reasons the InfoComm CTS certifications exist is to serve the consultant and integrator community. Clients will often require a certain number of consulting or integrator staff to have one or more of the CTS certifications. This is often dictated in the project's bid documents, excluding certain companies that don't meet the certification criteria from even beginning the bidding process. All that being said, I certainly see the CTS certification's value in the higher ed AV support world. Many of the AV industry equipment manufacturers offer training classes and certifications that are available to higher ed AV support folks. Many people simply disregard these manufacturer-led training classes as sales pitches to captive audiences, but I think many of them are very worthwhile. Naturally the manufacturer's motivation is to pitch their products to their target audience, but these training classes have really evolved over the years to now include useful information taught by some of the most brilliant minds in the industry. Some of the larger manufacturers in the industry offer "big picture" training classes that teach general AV industry technology and design trends. Naturally they relate these trends back to their specific product lines, but the majority of information taught in these classes is very useful to general higher ed AV support staff. Some of the manufacturers even tailor these classes to academic AV support subjects, so your staff doesn't have to sit through training sessions intended for other industries, such as the latest trends in 911 emergency command center design. Some manufacturers offer these classes online, but I usually get the most out of actually being in the classroom. Drilling down a bit more, the manufacturers also offer higher level training sessions that often focus on one specific AV technology, or a specific piece of their equipment. Some of the specific content taught in these classes may include AV streaming technology, control system/DSP programming, digital system design/installation techniques and networked AV systems. These classes often rely on lots of hands-on setup and testing of equipment, which is always very helpful. Having face-to-face access to the folks who designed the equipment is a great learning resource. When it comes to control system and DSP programming classes in particular, I have strong opinions about how AV programming should be handled on higher ed campuses. To really do control system programming right for anything more complex than a basic classroom system, schools really need to devote a full-time staff member to programming. While a full-time AV programmer is a tough expense to justify on most campuses, a staff member who is also responsible for system design, installation, daily support, etc. cannot really stay on top of current high-level programming techniques and features. All that being said, I think manufacturers' control system programming classes can be valuable for any higher ed AV staff. Staff members responsible for system design duties need to take at least the 101 programming class, to make sure they have an understanding of the features and capabilities of their control systems. Being able to at least talk the same language as the programmers (either independent or from hired integration firms) is key. DSP programming is a bit of a different animal, and I do think that higher ed AV support departments should devote a portion of someone's job description to high-level DSP programming. It's an easier learning curve than advanced control system programming, and it's certainly worth the time for managers to send their employees to the higher level DSP configuration classes. Don't think that these manufacturer training classes require large travel budgets just because the manufacturer is headquartered across the country. Many of these companies will offer regional training opportunities, often renting meeting rooms at hotels in select large cities across the county. I will say, though, that attending training sessions at the company's headquarters is usually best, since they typically don't have the same amount of demo and test equipment at the regional training sessions as they do in their HQ's training classrooms. Some manufacturers offer rewards programs to their customers, who can in turn obtain comped travel expenses to attend these training classes. It's always worth a conversation with your manufacturer rep if your department is able to accept gifts like this from companies. Over the past few years, the question has been asked if large AV conferences are still necessary, considering the plethora of online resources and manufacturer training opportunities available elsewhere. The record-breaking attendance numbers at the annual InfoComm show each year say to me that conferences are indeed still regarded as worthwhile events. Most higher ed tech managers seem to agree, but with the large price tag these conferences have for registration fees, travel expenses, training class tuition, etc., it's often hard to justify the expense. Still, I feel the show floor booths, training opportunities and networking opportunities presented to InfoComm attendees are an excellent resource to higher ed AV staff. There are many programs at the InfoComm event tailored to higher ed AV support. Between networking receptions, training classes, certification prep courses and technology tours of other schools, it really makes sense for technology managers to budget for their staff to make the trip. I think that higher level design and installation staff members need to make the trip to InfoComm every year or two, while mid- and low-level support staff can benefit from the trip every three or four years. Even though it's the largest AV conference in the U.S., InfoComm obviously isn't the only event available to higher ed AV staff. Conferences like CCUMC, UBTech and Educause are especially relevant to higher ed AV technology managers. These conferences don't focus as much on system design and installation, but rather on management and administrative topics.